Welcome to Hooked on Cycling holidays and our cycling holiday in Scotland. This particular cycling holiday in Scotland is a guided cycle tour by bike and boat. By day we shall plan daily cycle rides where you shall return to your floating hotel at night. 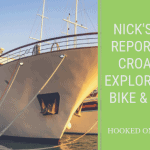 The great thing about bike and boat trips is that if one day you do not wish to cycle you can decide to stay on the ship and enjoy the sailing. Your ship for this trip is the Flying Dutchman, an ocean-going vessel, we want to discover with you some of the most beautiful places in this breath-taking country. Mass tourism has not reached these parts of Scotland, you shall experience vast remoteness, few cars and stunning natural landscapes envied throughout the world. From Oban, you shall head south through the stunning Argyle countryside before sailing to the Isle of Jura. Here there are more sheep and deer than the human population. Not forgetting its world-famous whisky distillery. Then we head north to the Isle of Mull where we shall explore for a few days before crossing back to the mainland for a day on the Morvern Peninsular. Individual flight to Edinburgh or Glasgow and from there either by train or bus to Oban. Your cabins on the Flying Dutchman are ready for you as of 5pm. Should you arrive earlier, we can store your luggage on board until check-in time. You are also welcome to use our transfer service leaving at 5.30pm from the train station in Edinburgh and at 6pm from Edinburgh airport. During a late dinner, you get to know your crew and tour guides. Day 2 Oban – Toberonochy 22 miles 36 km. After breakfast we set out for our first cycle trip. We shall cycle southwards from Oban through some hilly landscapes and along the shores of a small highland lake back to the sea. Here we shall cross to a remote peninsula before embarking on the ferry which takes us to the island of Luing. The island is made up of slate and was a major industry here years ago. The slate form this island has been used on many buildings in Scotland, namely the University of Edinburgh being one. At the Toberonochy dock, the Flying Dutchman awaits us to sail over to a secluded bay where we will spend the night. Day 3 Crinan – Loch Tabert 40 miles 65 km. After a short sailing to Crinan, we start the day back on our bikes. At first, we shall cycle along the Crinan Canal, leading from Crinan to Lochgilphead, it spared smaller ships the long sail around the Kintyre peninsula. Afterwards, we head south over the peninsula, most commonly known from the Paul McCartney song, Mull of Kintyre. Soon we reach a deeply cut loch when we board our ship and sail across to the Island of Jura. As we cross you shall see some stunning scenery. Day 4 Isle of Jura 17 miles 27 km. After our breakfast, we then cycle northwards on the Island of Jura along its south-east shore. The renowned author, George Orwell, spent the last three years of his life here and described it as the most unattainable place on earth. Enjoy this tranquil island while enjoying the remote scenes, which is only occasionally disturbed by one of the about 5,000 deer that live there. Soon we reach a small dock where the Flying Dutchman takes us to the island of Mull. On the way we pass the swirling waters of Corryvreckan, one of the largest natural whirlpools in the world where three great tidal streams converge – but do not fear, our experienced crew will guide us safely to a quiet bay on the island of Mull for the night. Today’s cycle tour is dedicated entirely to the spectacular natural beauty of Scotland. The route takes us through some hilly terrain and along the Island’s coastline. Behind every bend in the road, another breathtaking view awaits. After the road divides, and the few cars that we have encountered along the way so far have turned off towards Iona, we share the road virtually only with sheep and shaggy highland cattle grazing peacefully in the bright green meadows. Along an ever-changing coastal road, we cycle past Loch Na’ Keal to Salen where the ship is waiting for us. A short sailing brings us to Tobermoy bay. In this pretty, little place, with its colourful facades, an evening visit to an original Scottish pub is high on the agenda. This includes trying national dishes such as fish’n’chips, haggis, fried pizza or fried Mars Bar! Day 6 Mull Island Tobermory – Salen 31 miles 50 km. Today we will encounter an elevation gain on our ride through the northern part of the Island of Mull. A reward is a cozy tearoom offers us a welcomed reprieve before we head for the brilliant white beach of Calgary Bay and its crystal-clear waters. It is considered one of the most beautiful beaches in Scotland and swimming enthusiasts should not pass up this opportunity to jump in for a refreshing swim, but be warned the water will be cold. Ship ward bound we cycle through a lush valley until we meet the shoreline, shortly before Salen, offering breathtaking views. Our ship awaits us again in Salen for a little crossing to Lochaline on the Morvern peninsula, where we throw the anchor for the night. Day 7 Peninsula Morvern Lochaline – Kingairloch 16 miles 26 km. After a small crossing through the Sound of Mull to Lochaline a scenic cycling tour awaits us. After the first ascent, we reach an almost traffic-free road leading through the barren highlands. We follow hillsides, wild mountain streams and moorlands before we reach the Flying Dutchman, to ferry us back to Oban. Before dinner, we will have the opportunity to take a stroll through Oban. The McCaig’s Tower, an incomplete replica of the Coliseum in Rome, is a worthwhile visit. After breakfast, an individual return trip home from Oban or group transfer to the Edinburgh airport. Minimum Number of persons is 16. We are happy to introduce the Flying Dutchman of captain Klaas as an open sea two- masted topsail schooner which is now belonging to the fleet of Islandhopping. Due to the considerable security- and navigation technique the Flying Dutchman owns the worldwide permit for sailing tours. Because of the sail size of 480 m2 stages between islands can be managed with rigged sails- of course, Captain Klaas welcomes the active help of his guests. The Flying Dutchman was launched in 1903 as a herring lugger. The alteration took place during winter 2004: 10 double cabins and a triple cabin with own shower and toilet were included on board. The frontal saloon in the deckhouse can be used as a cosy dining area as well as a lounge. The cushioned benches offer enough space for the guests. At the stern one may sit next to the captain and might as well have a try to steer the 39m long ship. Note: The itinerary for this tour has changed slightly since this video was made. However, it still gives a good representation of the tour. By air, train, bus to Edinburgh or Glasgow then by train or coach to Oban. You can also book onto the group transfer from Edinburgh, leaving between 5-5.30pm from central Edinburgh or Edinburgh airport. A group transfer is also available on departure leaving Oban 7am and reaching Edinburgh airport around 10am.